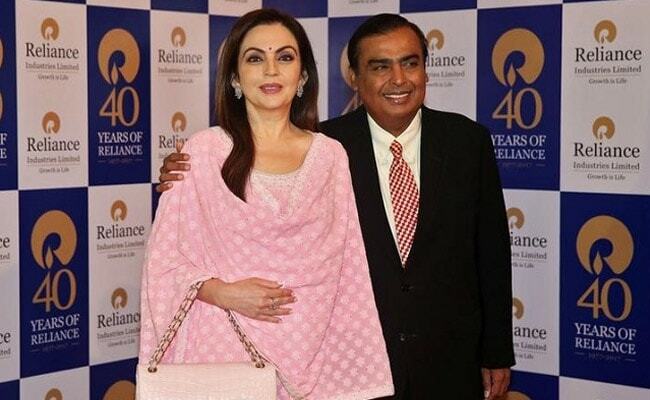 New Delhi: Billionaire Mukesh Ambani's family is the richest in Asia as their net worth rose by $19 billion to $44.8 billion, toppling the Lees of the Samsung empire, to claim the top position, according to the Forbes magazine. Despite dropping to the second spot, Korea's Lee family still saw its wealth soar by $11.2 billion to $40.8 billion this year as shares of Samsung Electronics moved up 75 per cent over the past year. According to Asia's 50 Richest Families list compiled by Forbes, Hong Kong's Kwok family, Asia's richest real estate household that controls Sun Hung Kai Properties, ranked third this year with a net wealth of $40.4 billion. Thailand's Chearavanont family of the Charoen Pokphand Group took the fourth spot on the list, with a net worth of $36.6 billion. "No family highlights this surge better than the Ambanis of India, this year's biggest gainer in dollar and percentage terms," Forbes said. It noted that shares in Mukesh Ambani's conglomerate Reliance Industries soared on the back of improved refining margins and the demand produced by its telecom arm, Reliance Jio, which notched up 140 million subscribers since its launch in 2016. On the list of Asia's Richest Families 2017, compiled by Forbes, India enjoys the biggest presence in the ranking for the third time with as many as 18 families. Among other richest Indian families on the list were the Premjis (rank 11, $19.2 billion net worth), the Hindujas (12th, $18.8 billion), the Mittals (14th, $17.2 billion), the Mistrys (16th, $16.1 billion) and the Birlas (19th, $14.1 billion). Some other Indian families that got into the exalted list included the Godrej family (20th, $14 billion), the Bajajs (26th, $9.3 billion), the Jindal family (32nd, $7.7 billion), the Burmans (35th, $7.05 billion), Eicher Motors' Lals (36th, $7 billion) and Shree Cement's Bangur family (37th, $6.7 billion). The Sehgal family (Motherson Sumi Systems) was ranked 41st on the list with a net worth of $6.2 billion, followed by the Wadia family (42nd, $6.14 billion), DLF's Kushal Pal Singh (44th, $6.1 billion), the Patel family, which controls Cadila (45th, $6 billion), the Piramals (47th, $5.38 billion) and the Munjals (48th, $5.37 billion). The list of Asia's 50 Richest Families is a snapshot of wealth using stock prices and currency exchange rates from the close of markets on November 3. Private companies were valued by using financial ratios and other comparisons with similar publicly traded firms. The ticket to entry for this year's list was $5 billion, $1.6 billion more than in 2016.